KDFI, virtual channel 27 (UHF digital channel 36), is a MyNetworkTV owned-and-operated television station serving the Dallas–Fort Worth Metroplex that is licensed to Dallas, Texas, United States. The station is owned by the Fox Television Stations subsidiary of 21st Century Fox, as part of a duopoly with Fox owned-and-operated station KDFW (channel 4). The two stations share studio facilities located on North Griffin Street in downtown Dallas; KDFI maintains transmitter facilities located south of Belt Line Road in Cedar Hill. On cable, KDFI is available on channel 7 on most providers in the Metroplex. The UHF channel 27 allocation in the Dallas-Fort Worth market was initially applied for broadcasting use by Overmyer Communications, who filed a license application in 1966. Gordon McLendon (who purchased the station for his son Barton) was granted a license for channel 27 in 1967 with a construction permit being issued in 1968. McClendon planned to launch a television station under the callsign KLIF-TV, which was to be based out of the building that also housed upstart radio station KNUS (98.7 FM, now KLUV) at 2110 Commerce; resources would also be pooled between the television and radio stations as KNUS planned to convert to an all-news format. However, the station never formally signed on and by 1972, the KLIF-TV license was deleted by the Federal Communications Commission (the KLIF calls were later used for a radio station broadcasting at 570 AM). The current television station on channel 27 first signed on the air on January 26, 1981 as KTWS-TV; the station was owned by Liberty Television. It originally operated as an independent station carrying a mix of religious and public affairs programs, business news programming from the Financial News Network, and network programs from ABC, NBC and CBS that were respectively preempted by WFAA (channel 8), KXAS-TV (channel 5) and KDFW. The station's original studio facilities were located at 433 Regal Row in northwest Dallas. Channel 27 aired some limited local news programming in the form of a five-minute news capsules that aired weekdays at the top of the hour between 4:00 and 6:00 p.m., anchored by former WFAA anchor Bob Gooding. The station also broadcast public domain movies during the daytime hours. At night, the station ran the over-the-air subscription television service Preview, which was later replaced by another such service VEU after it moved from KNBN-TV (channel 33, now KDAF). In 1984, Liberty Television sold the station to Dallas Media Investors Corporation, a Richardson-based company owned by John McKay, former station manager at KDFW-TV (channel 4). The station briefly went dark after the sale was finalized; the following month, the station returned to the air and its call letters were changed to the current KDFI-TV on August 16, 1984. KDFI dropped VEU programming in 1985, and became a general entertainment station for the entire broadcast day. It began running low-budget syndicated programs, older cartoons, and B-movies. The station continued to run pre-empted network shows as well, and had been able to balance its books. 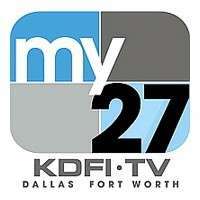 In 1993, Argyle Television, then-owner of KDFW-TV, entered into a local marketing agreement with KDFI and Dallas Media Investors; with this, channel 27 began running some programs carried on KDFW, mostly talk shows and rebroadcasts of the latter station's evening newscasts. When KDFW switched its affiliation to Fox in July 1995 as part of a group affiliation deal with New World Communications, the news rebroadcasts were dropped. KDFI continued to carry talk shows, while also adding a few cartoons in the morning hours, as well as a few sitcoms. After Fox Television Stations acquired KDFW in a group deal involving the 12 New World-owned Fox affiliates in July 1996, Fox Kids programming moved to KDFI in the fall of 1997 from original Fox station KDAF, as KDFW declined to carry the block (as did most of the other New World stations that joined Fox). By then, KDFI was a traditional independent station broadcasting cartoons, classic off-network sitcoms, syndicated talk and reality shows, and movies. In 2000, after the Federal Communications Commission began permitting television station duopolies, Fox Television Stations bought KDFI outright, creating the Metroplex's first duopoly (and effectively, the first to be owned by Fox as a whole). The station's operations were merged with KDFW at the latter's downtown studios on North Griffin Street. The station continued to carry Fox Kids programming; although in 2002, the weekday edition of the block was discontinued nationally, leaving only the Saturday morning lineup; Fox Kids was replaced by Fox Box (later renamed 4Kids TV) in September 2002, when the network leased its children's program block to 4Kids Entertainment. 4KidsTV was replaced by the infomercial block Weekend Marketplace in December 2008, after Fox and 4Kids due to a dispute over compensation from the lease agreement and affiliate clearance for the block. On February 22, 2006, News Corporation announced the launch of a new "sixth" network called MyNetworkTV, which would be operated by Fox Television Stations and its syndication division Twentieth Television. MyNetworkTV was created to compete against another upstart network that would launch at the same time that September, The CW (an amalgamated network that originally consisted primarily of UPN and The WB's higher-rated programs) as well as to give UPN and WB stations that were not mentioned as becoming CW affiliates another option besides converting to independent stations. KDFI was the only Fox-owned station to have been an independent station prior to joining the network, while all other News Corporation-owned stations were owned-and-operated stations of Fox or affiliates of UPN. It is also the largest MyNetworkTV affiliate to not have been formerly affiliated with either UPN or The WB. The station began branding itself on-air as "My 27" shortly after the announcement, reflecting the new network's branding conventions. A temporary logo using the circular 27 symbol and the word "my" (in place of the call letters) was created. The KDFI website accordingly changed its slogan to "Shows I Like Are on My27". On July 7, 2006, KDFI officially changed its logo to MyNetworkTV's four-square logo style. George Lowe, the voice of Space Ghost in Cartoon Network's Space Ghost Coast to Coast, has served as the station's imaging voice since its days as an independent under the LMA with Fox Television Stations. Syndicated programming on the station includes That '70s Show, Judge Judy and Modern Family. Occasionally as time permits, KDFI may air Fox network programs whenever KDFW is unable to in the event of extended breaking news or severe weather coverage. The station also aired two Dallas Cowboys games that also aired on the NFL Network during the 2007–2008 NFL season, along with the high definition feed for those games. The games against the Green Bay Packers on November 29 and Carolina Panthers on December 22, 2007 were the highest-rated telecasts in the history of KDFI. ↑ Bounce TV Adds KDFI Dallas, TVNewsCheck, March 30, 2012.